Worlds’s Largest Strawberry Short Cake Served at the festival site after the parade; Approximately 1:00 p.m – 5:00 p.m.
‌ elcome to the 108th anW nual Strawberry Festival. This year’s theme is Strawberry Campin’ and the Strawberry Festival is close to the unofficial kickoff of camping season after Memorial Day weekend. Feeling up for an adventurous treat we’ve stumbled upon for toasted marshmallow strawberries. That’s right! You dip a strawberry in marshmallow fluff, and roast it over the campfire. While we’re unsure about how well this will actually taste, if you decide to try it let us know how it went. But before you head off into the woods, enjoy the weekend as it’s a carefree time of fun and frolic, and of course there’s strawberry shortcake (it is the world’s largest). Traditions return such as the Grand and Junior parades, the open air fair and carnival. The strawberry princesses will grace us with their presence whether on a float or serving you shortcake. As you can see on this page, Strawberry Plaza will open this weekend. So check out the newly renovated small park, formerly mural park, or grab a cold beer (or root beer) from Conversion Brewing to celebrate. Enjoy the weekend and this wonderful time of year. We know we will! The section was written by Matt DeBow, of the Lebanon Express, and Alex Paul of the Albany Democrat Herald. 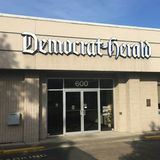 The cover photo was designed by Daniel Morgan, and the cover photo was taken by David Patton of the Democrat Herald. Lebanon City Manager Gary Marks paints a totem pole being restored for the downtown Strawberry Plaza project. We accept Oregon Trail Card, WIC & Farm Direct Nutrition Programs. Artist’s rendering of what the new Strawberry Plaza will look like. cess to as many people as possible, the trails plan also includes adding 13 miles of soft surface trails, which are dirt or bark dust trails. “I know people aren’t seeing that yet, because we haven’t been building those,” Sell said. BLT is planning to build soft surface trails at Ridgeway Butte, and by lakes on the east side of Santiam River. “So there’s a major soft surface trail system, and hard trail system that goes up on the butte,” Sell said. For more information about BLT, and a list of events, visit https://www. buildlebanontrails.com. The grand parade will be held at 11 a.m. on June 3 starting at the Walmart Parking lot and runs through Main Street. Strawberry Festival shortcake will be served at the festival site afterwards. Maddie Norris reacts to the news that she was selected as the 2017 queen of the Lebanon Strawberry Festival. her successor. As is customary, the new queen’s first task is to declare the start of the new Strawberry Festival. “I now proclaim the 108th Strawberry Festival open!” Mad- For a video and a gallery, see the online version of this story. die said. to pleasing spectators. The Strawberry Princesses will be passing out complimentary popsicles to all Junior Parade participants. Registration forms went out to the local schools, the Chamber of Commerce, and can be obtained through the “Entry Form” link as well. Make sure your registration form is signed so you can be a part of this great event! Staging begins at noon at Third and Grant streets (next to the Santiam Travel Station), and judging is from 1 to 2 p.m. Parade route The parade will start at the intersection of Main St and Market St towards the South end of town and running North on Main St for 2.5 miles to the intersection of Main St and Rose St toward the North end of town. The parade route is limited to the West two lanes of Main St until the Parade reaches the “Y” with Park St, when it begins to take up the whole road. For best viewing, be on the West side of Main St from Market to the “Y” , or on either side of Main St from the ‘Y” until Rose St. event, contact the Grand Parade team at grandparade@lebanonstrawberryfestival.com. About princess Amanda Princess Amanda Raymond is the daughter of Jon and Jennifer Raymond. She has two younger sisters: Ashley, 11, and Addison, 9. Her father is a deputy for the Linn County Sheriff’s Office and her mother is a stay-athome mom. Amanda participates in track and field, DECA, National Honors Society and has coached a volleyball team. family as a few of her family members come to Lebanon to join the celebration for the weekend. Brooklyn’s dad will send each one of his kids to get a strawberry shortcake “for him so he doesn’t look like he’s going up multiple times.” That ruse may not work this year, as Brooklyn will be serving Strawberry Shortcake herself at the fair. Her family also watches the fireworks together on Saturday night. Outside of the Strawberry Festival duties, Brooklyn runs a photography business. She started it because she loves taking pictures. “I really wanted a nice camera, and my sophomore year of high school I was gifted one by my grandmother,” Brooklyn said. And last summer she was gifted an even nicer camera. If Brooklyn were a strawberry-based dessert, she would be a strawberry lemonade cupcake because “it reminds me of being in the sun on a picnic day on the beach with my family,” Brooklyn said. Shortcake” label was applied early on, but has been disputed by other communities at times. In 1975, there was a “Battle of the Shortcakes” between Lebanon and Garden Grove, California. 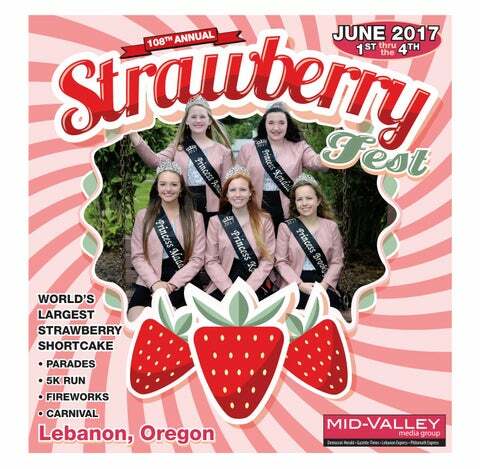 festival grounds at Cheadle Lake Park, organizers expect that about 15,000 free servings complete with juicy strawberries and whipped cream, will be handed out by the Oregon Dairy Wives, who donate the whipped cream. Beta Sigma Phi sorority members of Lebanon deliver the 1,000 pieces of shortcake to people who are unable to get out to the parade, including residents of The Oaks and Willamette Manor, patients at Samaritan Lebanon Community Hospital, and those on duty at the fire and police stations. The GFWC OFWC Lebanon Zenith Woman’s Club have been decorating the cake since 1964. About princess Katie Katie’s parents are Angie and David Fredric, Katie has a brother Andrew Fredric, 20. Katie is a varsity track and field athlete. She works at Rainbow West, the Christian bookstore in Albany. She coaches middle school volleyball for the Boys & Girls Club. than I’ve done anything else in my life.” Her family would often take off for a camping trip without knowing where they were going, and would just pick a spot on the side of the road to camp. ested artists may pick up an application at Lebanon City Hall – 925 S. Main Street, Lebanon Public Library – 55 Academy Street, or the Lebanon Senior Center – 80 Tangent Street. The deadline for the initial selection of art boards is 5 p.m. on July 11. If Katie were a Strawberry-based dessert, she would be cheesecake because she likes cheesecake and she’s cheesy, she said. For college, Katie was accepted to OSU, and plans to dual enroll at LBCC to study kinesiology because she wants to go into physical therapy. Her interest in that began her junior year when she suffered a back injury and physical therapy was able to help her with that injury. During her treatments, she started asking questions about how the physical therapy was helping her. “I’ve always been interested in exercise science because I’ve done sports since I was in first grade,” Katie said. fore the service (from 5:30 to 6 p.m.) and after the service (from 7:30 to 8 p.m.), various Christian and community groups that serve local youth will have display tables. Everyone is welcome to attend this event which is sponsored by Transform Lebanon, a network of pastors and leaders of Christian non-profit ministries. School. Kendall played soccer for four years, she is the choir counsel treasurer and is ASB treasurer. Kendall has received a $23,000 scholarship to attend Willamette University where she plans to study biology and international affairs. Pictured here our a few arrangement from last year’s Flower and Quilt show during the Strawberry Festival. 541-259-1500, and for Art entries call 541-259-3039. For a Flower Show Schedule, which is a list of design categories and information on how to enter horticulture, visit Lebanongardenclub.com. •• Archery is fun •• for the entire family. Complete Bow Tuning; Custom Arrows; and Complete Accessory lines. Exclusive Mathews Dealer. 19 Lane Indoor 20 Yard Range. Archery Lessons by an NAA Level 3 Coach. PANCAKE BREAKFAST The Lebanon Optimist Club will ‌ host a pancake breakfast from 6:30 to 10:30 a.m. on June 3, at Linn Lanes parking lot. The cost is $6 per person and $3 for kids 12 and under or those in military uniform. The breakfast is a great way to fuel up before the Grand Parade. strawberry The Strawberry Princesses pose with 1941 Queen Ruth Shackman at Cascade Manor. Ruth during the lunch. Princess Brooklyn told Queen Ruth “I feel honored to sit with you. “She is quite a doll,” princess Brooklyn told the Lebanon Express. “It’s been fun visiting.” Queen Ruth said it was fun to see how the court has developed over the years. greater and the many ways in which they enrich our communities. Our theme is "Working Together for Strong, Healthy, and Supportive Mennonite Village invites youtotothe celebrate men and age 55better and Communities," which speaks opportunities we women have to create greater and thehealthier many ways in which enrich our communities. care, reinforce lifestyles, andthey improve overall quality of life. The day's events, thanks to our generous sponsors, will be free of charge and open to all. Shuttle buses will transport guests to and from the outdoor pavilion throughout the event. For a schedule full scheduleofofevents the day’sfor events, visitAmericans’ OlderAmericansDay.org. The Older Day includes: 7:30 AM Walk for Wellness Registration Walk for Wellness Healthy (while supplies last) 8:00 AM Breakfast Walk for Wellness Active 8:00 AMLiving FairHealthy Breakfast Health 8:00 AMScreenings Outdoor Farmers’Market Mennonite Village Tours 8:00 AM Active Living Fair (36 Businesses & Nonprofits) Music by The Maharimbas 8:00 AM Mennonite Village Tour of Homes Music by Larry Wilder 9:00 AM Wellness Activities & Demonstrations A Free Lunch (while supplies last) 11:30 Prize AM Drawings Free Lunch Yep! That’s right! 11:30 AM Music by Larry Wilder and the Americana Trio And more! Mennonite Village considers and admits people age 55 and older without regard to race, color, national origin, religion, gender, sexual orientation, or disability.